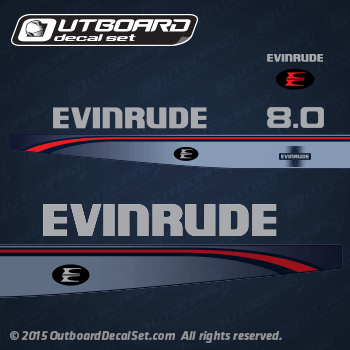 Evinrude 8.0 hp decal set replica from the mid 90's for 1995, 1996 and 1997 Outboards. Referenced Part number 0284816. BE8RCB, BE8RCH, BE8RCLB, BE8RCLH, BE8REDS, BE8RLEDS, BE8SRLEDS, E8REDS, E8REOD, E8REUC, E8RLEDS, E8RLEOD, E8RLEUC, E8SRLEDS, E8SRLEOD, E8SRLEUC.